The LC is a turning point in every sense. It marks a new moment for Lexus, and for our drivers. Created in our world-class aerodynamics research facility in Japan, it brings you a drive like no other, wherever your next venture leads you. Revealed in Detroit in 2016, at the North American International Auto Show (NAIAS), the LC instantly drew industry attention and accolades. Diverse teams from across Lexus united to produce a car which fuses elevated design with unmatched performance. As well as being a wonder to drive, it makes a bold statement about Lexus’s future direction. In the LC, the translation of concept to production is simply unprecedented. Expressive design comes together with the greatest engineering expertise to create a pure driving experience that remains luxurious through and through. This is extraordinary vision, realised down to the finest detail. 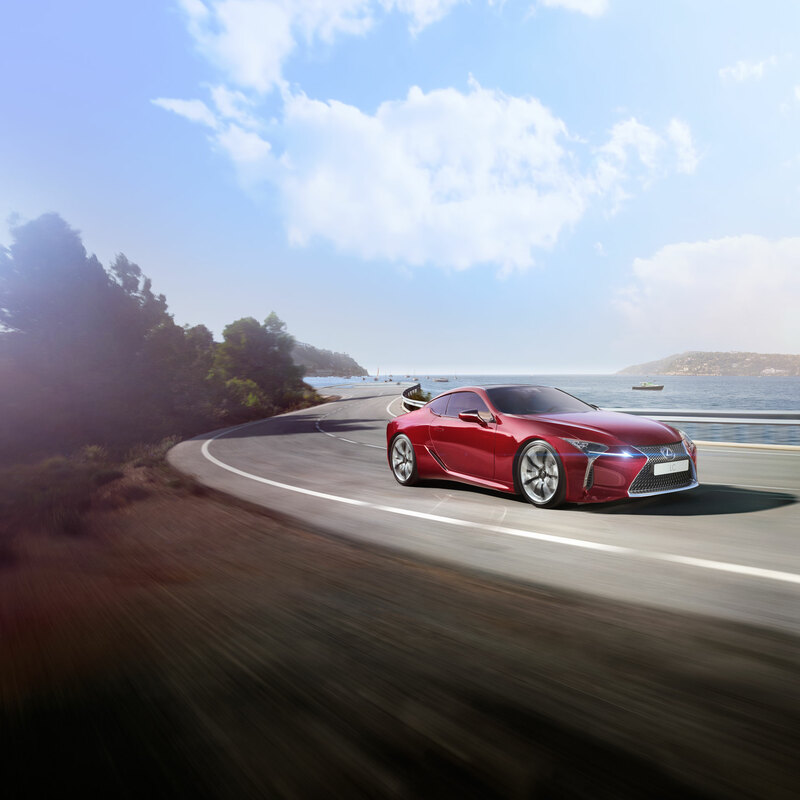 Inspired by the award-winning LF-LC concept debuted in 2012, the LC shatters industry conventions and expectations. Lexus engineers and designers worked tirelessly to bring the LC to life. Just like our world famous LFA supercar, the LC is built by Takumi master craftspeople. Car-making is their vocation, and decades of experience mean they know precision and beauty intimately, raising standards to new heights. Slip behind the wheel of the LC and you’ll meet with a unique driving experience, thanks to an array of innovative new features. You’ll also be struck by the model’s dynamic luxury. A truly elegant, evocative and fluid interpretation of our L-Finesse design philosophy. Under the unrivalled care of the Takumi, the LC is one of the first vehicles to have been developed entirely at our world-class aerodynamics research facility in Japan. It marks the dawn of a new era. The LC 500h pioneers new hybrid technology for Lexus. It’s powered by a revolutionary Multi Stage Hybrid System, delivering efficient, low emission power and yet uncompromised sporting, evocative driving experience. Witness a next generation hybrid. In the LC's Multi Stage Hybrid System, two power sources work together intelligently. Both the battery powered electric motor and the petrol-driven engine can power the car alone. Or they can team up together when it counts. The result? Incredible efficiency, low emissions, an exhilarating driving experience, and impressive acceleration. Our system monitors your driving conditions and seamlessly controls the flow of power, making the optimum choice for you. Or, if you wish, you can take control with Drive Mode Select. Multi Stage Hybrid makes an infinitely sportier hybrid possible. A 4-speed automatic transmission has been brought into play. This enables the simulation of 10 unique gears, which the driver can swiftly switch between. Hit the accelerator for agile, responsive power, or enjoy smarter efficiency at lower speeds. 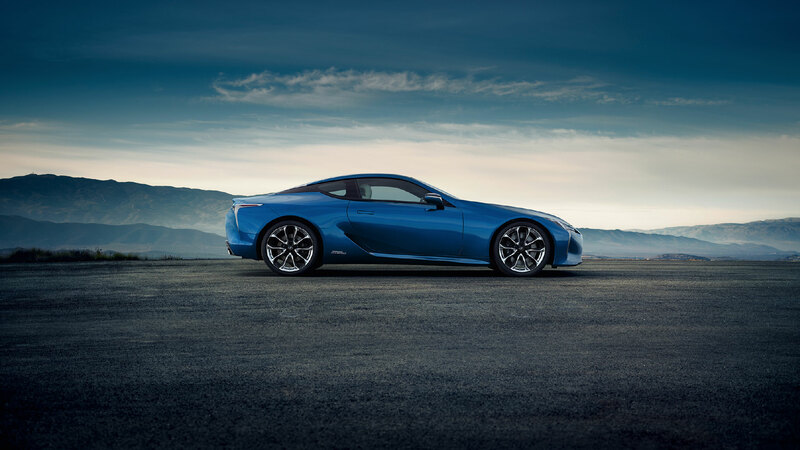 The LC’s engineering is honed to perfection, to create an unparalleled driving experience. We know that even the smallest component can contribute to a powerful outcome. The LC 500’s engine uses a dual intake inlet. This helps the system breathe, and facilitates the engine’s fantastic sound – music to anyone's ears. This ‘naturally aspirated’ engine pairs beautifully with the sports coupé as a whole. It complements the model's linear power delivery, giving you ease of control and unmistakable exhilaration when you’re behind the wheel. On our journey to driving the future of Lexus forward, we created a wholly new driving experience. The character and feel of the LC is unlike any Lexus that went before it. As we were bringing the LC to life, we visualised our desired outcome at every turn: a sharper, more refined driving experience. Agile, nimble, powerful. We wanted to build a superior ride quality befitting a luxury sports coupé, but one that also surprises, igniting drivers’ passions. If you’ve had the opportunity to take the LC for a spin, you’ll know we achieved our ambitious aim.